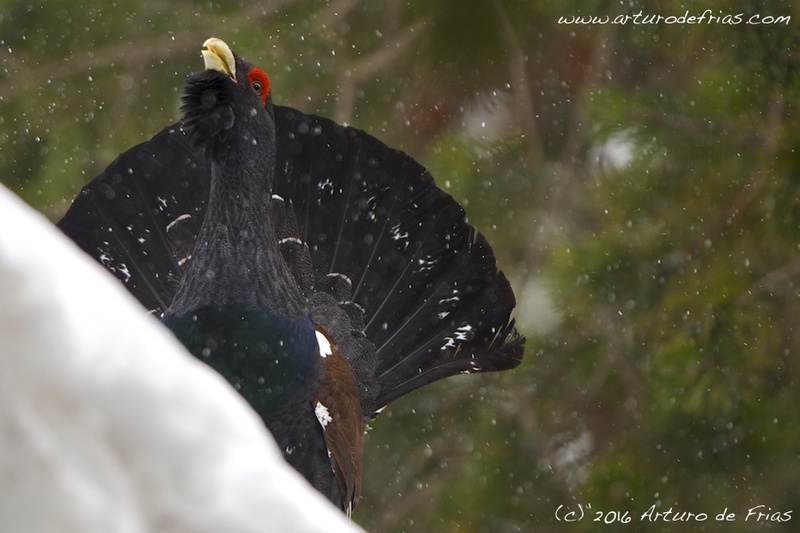 The courtship song of the male Western Capercaillie (Tetrao urogallus) is one of the most characteristic birdsongs. It is a low-volume collection of rasping noises, "clicks" and "pops", arranged in three separate verses, and then repeated again and again, for hours. In www.arkive.org there is a good video, type "Capercaillie Male Display" in the search function. El canto nupcial del urogallo (Tetrao urogallus) es una curiosa colección de roces, "pops" and "clicks", repartidos en tres estrofas, y repetidos innumerables veces, durante horas. En www.arkive.org hay un video muy bueno, escribe "Capercaillie Male Display" en la función de búsqueda.